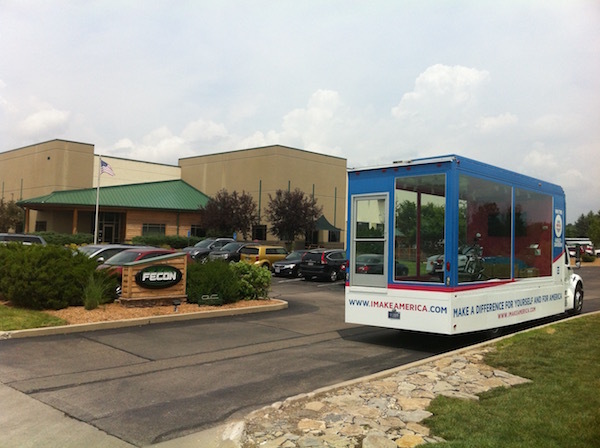 What size mobile showroom is best for mobile tours? At the beginning of the year we had a lot of inquiries into our large platform offerings, double expandable trucks and trailers that all kept going a similar direction. The client would explain they wanted pricing, costs, etc for the large format asset and the conversation would begin. Each time the more we learned about the program and how the truck or trailer was to be used we came to the same conclusion. The vehicle they wanted was the wrong vehicle for the program. Eventually in each case we would stop the conversation, ask them to backup and walk them through how we recommend vehicles. There are a lot of considerations when picking a mobile showroom or training facility for a business to business mobile tour. For some projects the there are physical requirements that make the choice easier. For example, if you have large machinery to display or are having 30 plus guests at one time you should probably be looking at single or double expandable trailers. But for some the answer is not that clear and there are many trailer options and sizes out there. The following are some things to consider. There are many things to consider when selecting the right trailer for a b2b tour. Thinking through the execution logistics of a tour can help narrow the field, at least a little. Mobile showrooms can range in size from simple 8′ by 8′ pod style structures up to our largest showroom, a 53′ double expandable trailer. What Size Mobile Showroom is best? That can depend a on several factors. The size of the trailer required should not only be based on the product being showcased but also take into account tour schedules and type of partner facility to be visited. Getting a 44-53 foot trailer in and out of smaller facilities can be an ordeal requiring satellite locations and advanced site surveys. Sacrificing showroom size for a smaller, more agile trailer such as our mobile exhibit trailer, our line of pop-up trailers, or even a super agile glass walled display truck can allow access to more locations. That is not to say a large trailer tour cannot meet the same rigors as smaller vehicles. Large trailers can just require more planning and onsite logistics. However, do not underestimate the value of a large trailer’s impact on partners and consumers alike. Shows off how tight parking lots can be. Larger trailers create large impact and leave a memorable impression. B2b marketing trailer size guide based on venue. There are no 100% answers that work every time in mobile marketing. While on the surface two b2b campaigns may look the same, each program will have a slightly different focus and idea they are trying to get across to their audience. It may be much more important for a company wanting to convey commitment to a new sector to chose a large footprint trailer to create a robust training center versus the logistical payoffs of a smaller easy access trailer. Consider the following a jumping off point, not a rule. Manufacturing Facilities – Space is usually not an issue. They are used to semi trucks making deliveries so typically access is not an issue 8′ to 53′ trailers. Office Park – Space is available but be careful. Just because a parking lot is large enough for a semi trailer does not mean that it was built for it. Aside from weight, consider height clearance from trees and architectural features. Steep entry angles can also cause issues for trailers over 35 feet. A safe bet is a bumper pull trailer under 30 feet in length or a gooseneck under 35 feet. Straight trucks are pretty agile but can be 1 – 2 feet taller than the comparable trailer adding to potential height issues. Consumer Locations – If you are a b2b company whose clients operate retail stores direct to the public your tour may consist strip malls and shopping centers. In this case a straight truck may be best. These types of venues are created to be accessed by delivery trucks so the added height of the straight truck should not be an issue. Also straight trucks are fairly maneuverable in tight areas and most (26′ box and under) can fit into two end to end parking spaces. Although this does not take into account entry stairs. Recommend 16 to 22 feet in box length in dense areas such as northeast and west coast. 16 – 26 feet in box length in less dense regions such as southeast and midwest.